Schematic diagram of Lawrence’s hypothesis for disintegration of the deuteron to a proton and a neutron in the electric field of a nucleus. Bottom: Rutherford’s proposal that two colliding deuterons decay either to hydrogen-3 or helium-3, yielding protons and neutrons. Cockcroft, Marcus Oliphant, and Rutherford all dismissed the deuteron hypothesis and advised Lawrence to look for contamination of his targets or his tank. Back in the friendly West, Lawrence hastily reviewed the possibility of systematic contamination with the help of chemical colleague Lewis. The resulting paper, sent to the Physical Review in December 1933, should have convinced “the most skeptical [according to Lawrence] that the deuteron is energetically unstable and disintegrates into a proton and a neutron.” Some friends, for example Jesse Beams, thought Lawrence’s answer decisive. Others, including Charles Lauritsen and Merle Tuve, repeated the experiments with immaculate apparatus and did not find Lawrence’s protons. Then Rutherford found the fast protons, but only after deliberately contaminating his targets with deuterium. Lawrence’s conviction waned. By April 1934, with artificial radioactivity claiming his attention, he had discarded the deuteron disintegration hypothesis. Top: Schematic diagram of Lawrence’s hypothesis for disintegration of the deuteron to a proton and a neutron in the electric field of a nucleus. 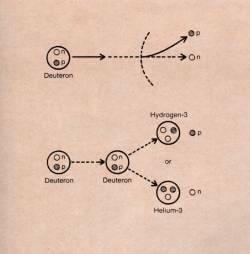 Bottom: Rutherford’s proposal that two colliding deuterons decay either to hydrogen-3 or helium-3, yielding protons and neutrons.